Los Angeles is the wage theft capital of the United States. Workers in Los Angeles lose $1.4 billion each year to wage theft. Statewide, the loss is even more staggering. As a result of these injustices, working people and their families in low-wage jobs, a majority of whom are immigrants and/or people of color, face food insecurity, experience health problems, and endure unfit housing conditions. To address this, KIWA integrates worker organizing and leadership development with policy change. In doing so we are building power in our communities to challenge these conditions and the policies that tolerate and perpetuate them. KIWA provides information on labor law and assists workers who have experienced wage theft to advocate for themselves. Our clinic will now also cover know-your-rights and guidance on all employment law, including wrongful termination, discrimination (including sexual harassment), whistleblowing, unemployment insurance, and retaliation. Each year, we provide information to thousands of low-wage workers and assist workers in filing millions of dollars in wage claims. Our Worker Empowerment Clinic is every Thursday from 6-7 PM. Workers are welcome to arrive any time between 6 and 7 and we will assist on a first come, first serve basis. Email us at info@kiwa.org for any questions. For more on wage theft, click here. After Los Angeles passed the $15 minimum wage increase, so did many other municipalities in L.A. County. Because KIWA was a key advocate in the campaign to not only raise the minimum wage, but enforce it, we have been contracted by the City of Los Angeles, the City of Santa Monica, and Los Angeles County to conduct outreach and education around the new minimum wage law and its provisions to both workers and employers. 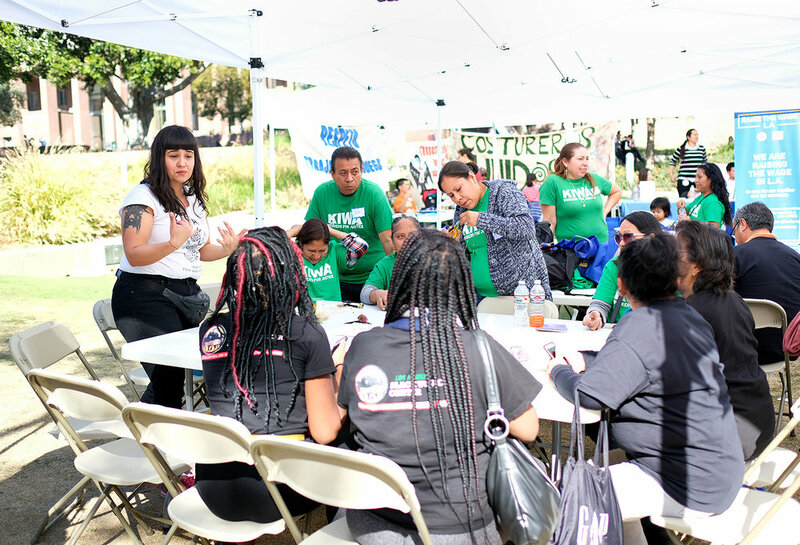 With KIWA organizers and members on the streets in L.A., Santa Monica, and unincorporated Los Angeles County, low-wage workers in the region will have the knowledge and resources they need to fight for dignity and respect in the workplace. The Los Angeles Worker Center's mission is to raise the visibility of, and support organizing by, low-wage workers, immigrant and refugee workers, and workers of color in Los Angeles. KIWA is one of the anchor organizations in the LAWCN steering committee, which is comprised of LA Black Worker Center (LABWC), Bet Tzedek Legal Services, Central American Resource Center (CARECEN), CLEAN Car Wash Campaign, Garment Worker Center (GWC), Instituto de Educación Popular del Sur de California (IDEPSCA), Pilipino Worker Center (PWC), Restaurant Opportunities Center - Los Angeles (ROC-LA), Strategic Concepts in Organizing and Policy Education (SCOPE), UCLA Downtown Labor Center, and Warehouse Worker Resource Center (WWRC). Our current projects include retaliation protection in low-wage workplaces, strengthening wage theft enforcement in LA City and County, and building a wellness-centered culture throughout our member organizations. KIWA leads a group community-based organizations known as the LA County Workplace Justice Collaborative to work with the LA County Department of Consumer and Business Affairs on enforcement of the Minimum Wage Ordinance that took effect on July 1, 2016. The Collaborative consists of organizations with daily ties to workers and businesses most affected by the minimum-wage increase, including industries such as restaurant, retail, car wash, home care, and warehousing. Activities include direct outreach, community-based education events, worker and employer trainings, and counseling and referrals for workers experiencing labor standards violations. The partnership emphasizes outreach to workers in low-wage industries who disproportionately experience workplace violations. Our partners include Pilipino Worker Center (PWC), Restaurant Opportunities Center (ROC-LA), Coalition for Humane Immigrant Rights of Los Angeles (CHIRLA), CLEAN Car Wash Campaign, Wage Justice Center (WJC) and Warehouse Worker Resource Center (WWRC). KIWA was on the steering committee of this groundbreaking campaign for economic dignity in Los Angeles City and County: a $15/hour minimum wage, effective enforcement against wage theft, and earned sick days. Our work on this campaign stems from our role as an anchor organization of the Los Angeles Coalition Against Wage Theft. KIWA and allies including CLEAN Carwash, ROC-LA, the UCLA Labor Center,and many more have been advocating for smart, effective citywide policies that will impose greater penalties on employers who rob workers of their wages. Unethical employers devastate the families and communities of Los Angeles, and make it harder for honest businesses to survive. Now, by joining with efforts for a higher minimum wage and earned sick days, we and our partners on this campaign are bringing Angelenos together around a far-reaching platform for justice and equity in Los Angeles. Wage theft is not only robbing workers of their paychecks. It is robbing them of their health, their homes, their food security, their peace of mind–it robs families of their dreams. In California, we have the opportunity to start to turn that around. In 2015, KIWA co-sponsored SB 588 (De León)”A Fair Day’s Pay” with SEIU California and the Wage Justice Center, to give workers more tools to collect from deadbeat employers. 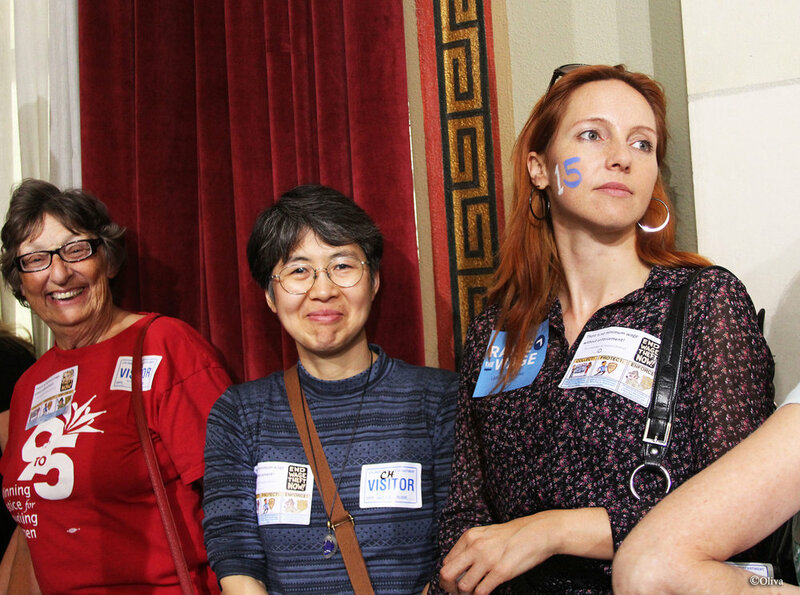 With these allies and others including USWW, Maintenance Cooperation Trust Fund, and UCLA Labor Center, we together wrote the bill and fought for several years to pass it, building a statewide coalition of over 60 organizations. On October 11, 2015 Governor Jerry Brown signed SB 588 into law. SB 588 will crack down on employers who, for decades, have been stealing wages from workers’ paychecks. This is a landmark victory that will allow workers and their families to recover millions of dollars in wages that was stolen from them. Now KIWA is conducting outreach to ensure that workers and employers are aware of the new collection and enforcement tools created by this law. In addition to workers, KIWA is partnering with the California Division of Labor Standards Enforcement, the U.S. Department of Labor, local business owners, and Koreatown business associations to provide information on labor laws, so that principled and committed employers can get the information they need. Our seminar for Korean-speaking business owners was endorsed by the Korean American Chamber of Commerce-Los Angeles.